Need social networking software to post updates to Facebook, Twitter and LinkedIn profiles? Then Seesmic is the best one in the market available. You can also follow friends on Twitter and Facebook and share links, photos, videos, and text in one place. Seesmic is available to Desktop as well as for Android mobiles, Windows Mobile and in App Store. Desktop support includes Mac OS X, Windows XP and Vista. It’s completely free to download and run. Filter messages of Admin and Fans in Facebook Page. Send messages & tweets, post images, shorten links and give replies in one place. Post to Facebook, Twitter and LinkedIn accounts at once. Displays limited Facebook Fan posts in the Sent column. Improved User Interface and enhancements. 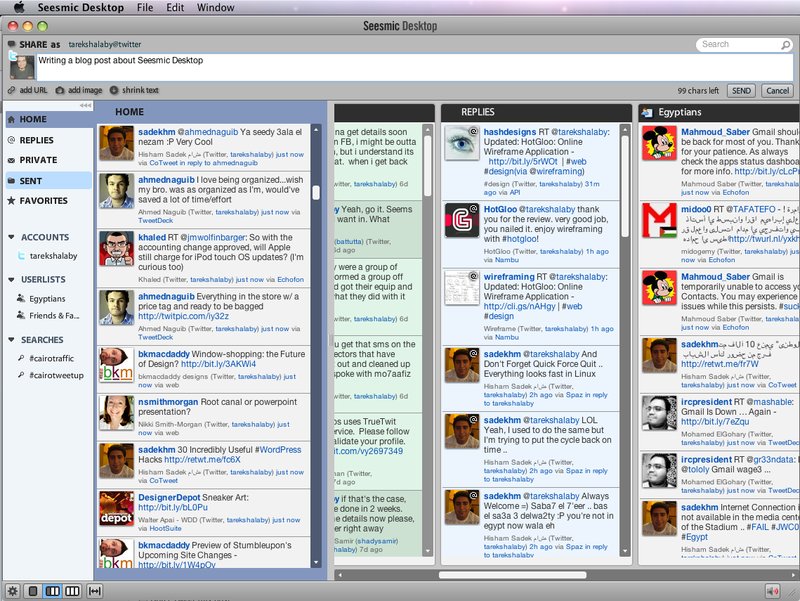 Side bar and Multi-column view. Requires cross-platform AIR app to run Seesmic program. Integrated Search Box and text-field. Keeps track of all your Facebook, Twitter and LinkedIn accounts in an easy manner. Download the latest version of this social web browser and management software for free. You can download either Mobile or Desktop version.